Cynamon is the third time Ranger Dusty and Gold'n Hawk genes have combined, so we knew the results would be top-shelf, but Cynamon has exceeded our expectations for excellence in disposition! He is both sensible and highly interactive; he has energy and enthusiasm with innate self-control. Cynamon is also notably active and athletic. 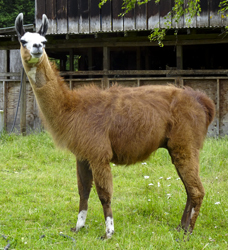 If llamas competed in cross-country jumping courses, that would be Cynamon's career! Jim is paricularly enamoured of Cynamon. Because we already have two fine shortcoat half-sibs, one from each side (maternal and paternal) as stud prospects, it wasn't reasonable to for us to keep Cynamon intact for breeding. But what is not a good thing for our breeding program will be a wonderful thing for Cynamon — he will get to enjoy being a happy-go-lucky gelding, and in fact Cynamon will be retained as our sorely-needed working and "trainer" gelding ... eventually. For now, he's enjoying his youth and we are enjoying interacting with him, watching his growth and development ... and his antics with agemates Dunc'n Hawk and Carhartt. Cynamon has forged an unusual friendship with one of the new barn kittens (Freya). "Cynamon" is the Polish spelling of Cinnamon ... giving an uncommon fellow an uncommon version of this very apt name for his coloration.